Let Aqua-Tech be your trusted team for diagnostics and repairs, on-going maintenance or anything else your require for your swimming pool or hot tub. Our skilled team is here to help you love your backyard. Get $200 OFF a new Pentair IntelliPro Pump, and save even more each season with this highly efficient smart pump! Aqua-Tech has been built on providing our customers with the highest level of service to match their discerning tastes. For us, installing a swimming pool or hot tub is just the beginning of our relationship with our customers. For preventative maintenance, our skilled and friendly in-house team provides services including pool opening and weekly management and care. 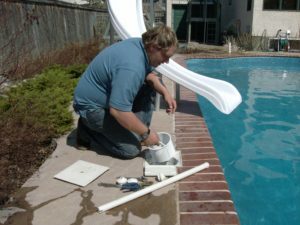 We can also help you with a one-time thorough cleaning of your pool, or provide you with a portable filter to help you return your pool to swimmable water. If an unexpected event gets the best of your pool, our Green to Clean service will get you swimming again fast. We’ll also take care of your investment when you go out of town. For any of these services or ones you don’t see listed, simply call our service team to find out how we’ll meet your needs. If you encounter an issue with your hot tub or pool, we’re here to diagnose and fix the problem. We’ll also recommend the best way to make sure it doesn’t happen again. Our skilled team is head and shoulders above the rest and when you entrust us with servicing your swimming pool or hot tub, you’re getting the knowledge that can only come with serving Winnipeg pool and hot tub owners for three decades. I made the decision to travel across the city to you guys and I am very pleased with the service and assistance to say the least. You should be very proud of what you have accomplished and to see an owner of a company wearing coveralls and still being hands on is refreshing. As your premium pool and hot tub service partner, we get it right the first time so you won’t have to schedule multiple visits from our team. Our experience, in-house capabilities and premium replacement parts allow us to efficiently get your pool back up and running so you won’t need to see us again until it’s pool closing time—unless we’re taking care of your weekly maintenance! Get in touch now to book your service or to find out how we can help you keep your swimming pool or hot tub in pristine condition. Choose Aqua-Tech to manage every step of your pool opening and dive in sooner! Switching to salt water can transform your pool. Discover the benefits and unique requirements of salt water. Save time, money and hassle. Choose Aqua-Tech for your on-going weekly maintenance. When you turn to Aqua-Tech, our skilled team will ensure that your pool stays clean and sparkling all season long—what more could you ask for?